Way back in the 1990s, when I still lived in the Netherlands, I went to a stamp fair in The Hague and took my place among a number of collectors who were debating which country issued the most beautiful stamps. Being the staunch anglophile that I was, I butted in immediately and said: "Well, that has to be Great Britain of course!" I was surprised and rather miffed to find that I was absolutely the only one who thought so. Having recently been treated to beauties such as the 1997 Queen's Horses, the 1998 Endangered Species, Queen's Beasts and Lighthouses, and with the magnificent Millennium series just around the corner (though obviously I did not yet know about these! ), I couldn't for the life of me understand how anybody could not think they were the best among the lot. It may not surprise you that there was no consensus at the end of a heated discussion but it seemed that there was a slight majority for Austria. In silence I had to admit that, yes, Austria did manage to come up with a solid catalogue of wonderfully produced stamps. 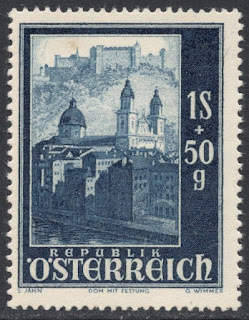 I was reminded of all this because I had to buy a lot of Austria lately and was struck once again by the beauty of their stamps. The set of which I'm showing you some values today is a very fine example indeed of the many, often recess-printed, stamps that Austria used to produce in their post-war years. It is a charity set issued in 1948 with a surcharge for the Salzburg Cathedral Fund, which was badly damaged in the war. 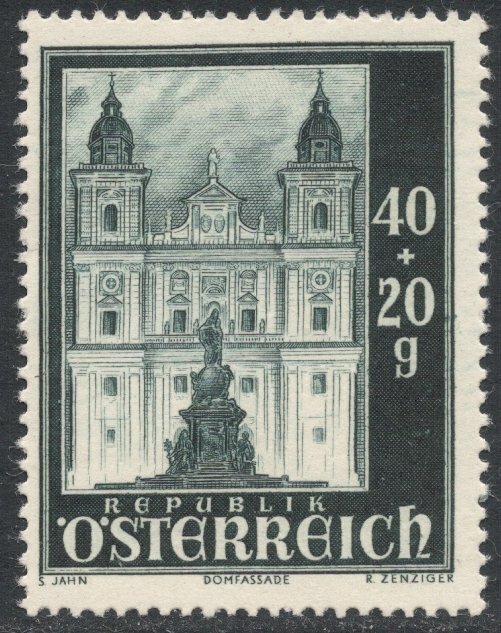 The stamps are all designed by S. Jahn, and engraved by a range of famous names, among which for example R. Toth and G. Wimmer. 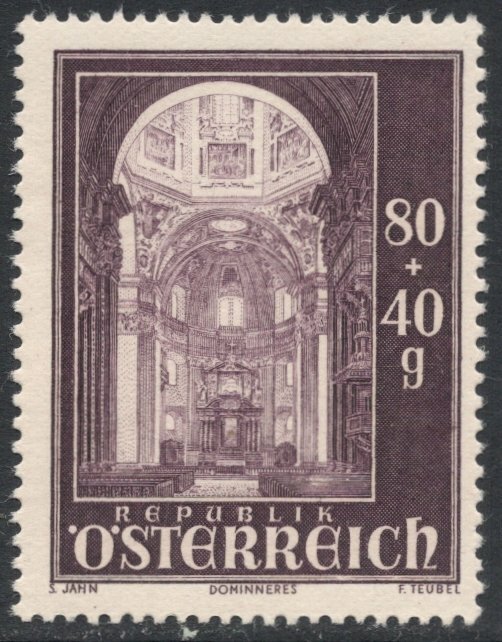 There are eight values in all, six of which depict various views of the cathedral. 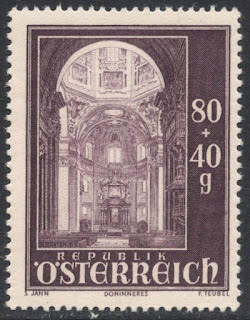 Now I suppose a cathedral is rather a good subject for a stamp, and almost always turns out well, but these stamps here are of a magnificent elegance, I think. As soon as I saw them in real life, they became my instant Austrian favourites. And the great thing is that Austria managed to keep up the good work. 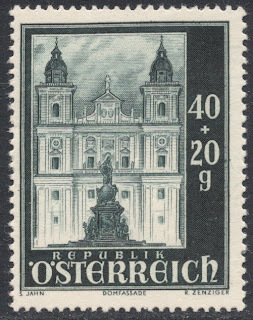 Just look at the range of wonderful definitives they issued from the 1940s onwards: the 1948 provincial costumes set, the 1957 Views set, the 1973 Views set, and the 1984 Abbeys & Monasteries set, are all beautiful sets in their own right. The fact that they are (part) recess-printed will help as that usually gives a stamp an air of importance. 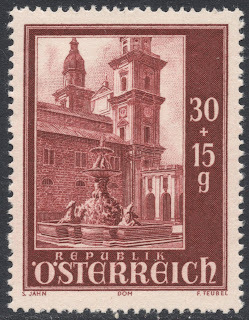 It is therefore an extra joy to see that recess-printing is also used quite often for the Austrian commemorative issues. 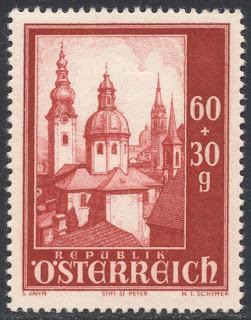 So yes, many years after that discussion in The Hague, I must admit that I now fully agree with that lot and also believe that it may indeed well be Austria which has the most consistent range of stunningly beautiful stamps! PS: It would be great to hear from you if you agree, and if not, why not. Why not leave your comments on this forum thread? Thanks! Liking the Millennium series? Controversial! I think the stamps illustrated in the article are nice, but like anything requiring opinion, its always down to personal preference. 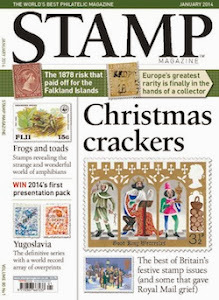 Myself, I'm not much of a fan of contemporary GB stamps, but that's just me. I really think many 80s commemoratives from the UK are some of the best we've done, and I don't know enough on other countries to comment. I have a few Canadian stamps which are very nice though. 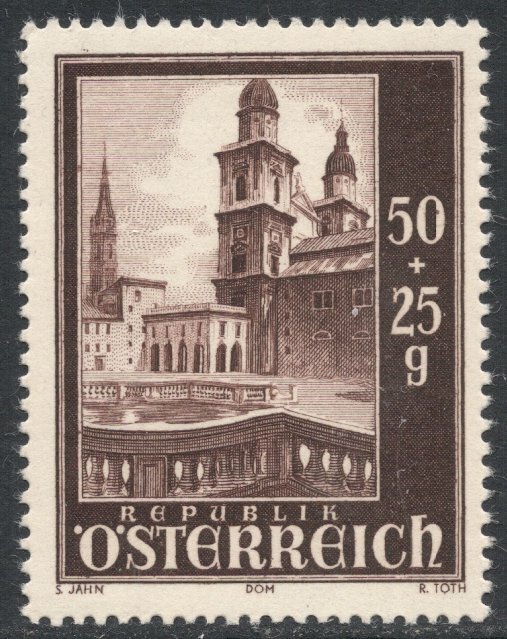 I admit that Austria has beautiful stamps. The printing quality as well as the designs are superb. My preference though goes to France. I think that the French Post CONSISTENTLY performs at a high level of engraving and printing. But, yes, it is a matter of taste. Yes, of course, Richard, it's all down to persional taste and preference. that's why it is so interesting to see what others come up with and why. I agree with you, Toon, that you can't go really wrong with French stamps either. Over on the website's forum, we've already had Liberia and Mongolia mentioned, which is I suppose a rather unusual choice. Makes me want to go to my catalogues and have a browse! Another good blog Adrian. I enjoyed reading it a change from my Kindle, sorry Twinkle!!!! Hi Kathy! If you read this, you may want to email me personally on rerrick at btopenworld dot com, with the at and dot replaced with @ and . of course.